Bianca's not really for sale, but her unborn cria will be!!! 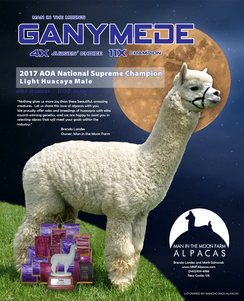 This cria will be a full sibling to Man in the Moon's Peruvian Ganymede, a 4X Judges Choice, 11X Champion, AND the 2017 AOA National Supreme Color Champion (Huacaya Light Male)! For obvious reasons, Bianca will remain in our foundation herd. 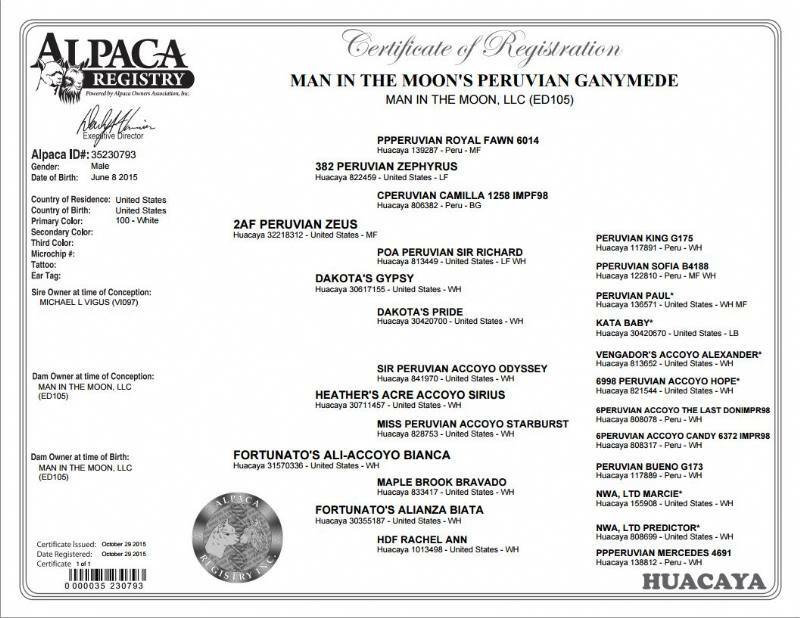 She will be rebred to 2AF Peruvian Zeus, who is the sire of her first offspring, GANYMEDE. 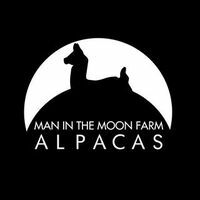 This cria may be purchased in utero...whatever she produces is bound to be amazing! He is the 2017 AOA National Light Male Supreme Champion! 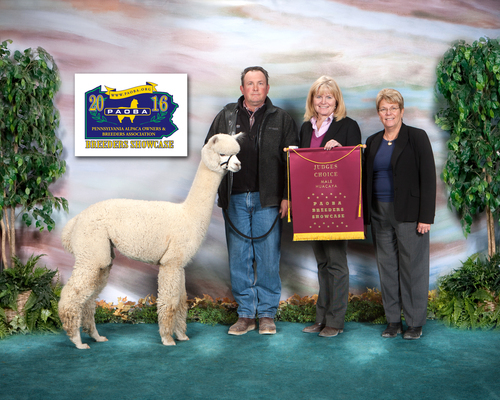 4X Judge's Choice + 11X Color Champion + 1X Best Bred & Owned at 29 months old & breeding! 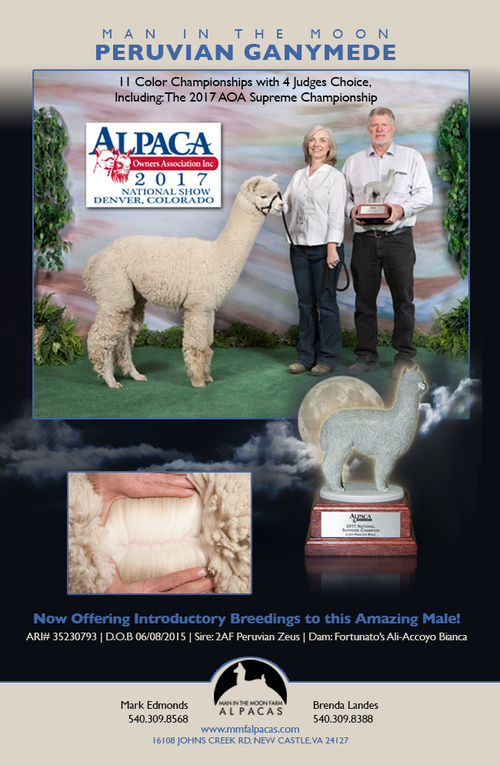 We are thrilled, humbled, and honored to have this magnificent young male...You've just got to see his fleece -- it's the same ALL over! 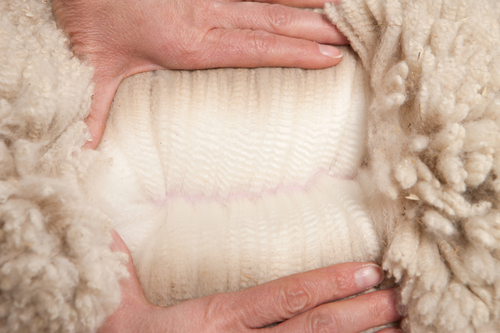 "his fleece is the same from skin to tip, back to front, all over..."
...he is "the same...all over." This is exactly what you want to hear. 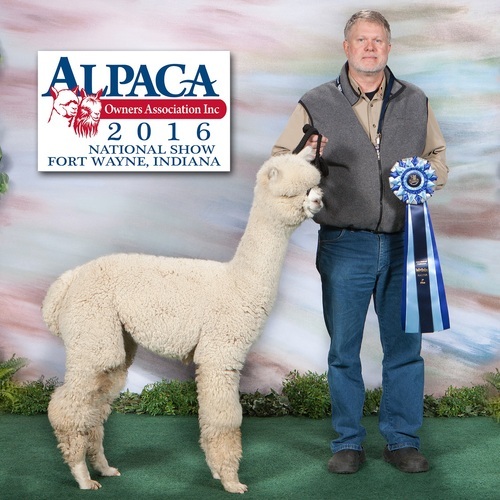 "clear winner" in the light Color Championship at the tough 2016 NEAOBA and at 2016 Empire -- beating out offspring of some of the most venerated herdsires in the country. "really well balanced and showy male, with overall stature and conformation, correct in his movement, with lovely density, good expression of character throughout, lovely exhibition of overall crimp style and consistency." 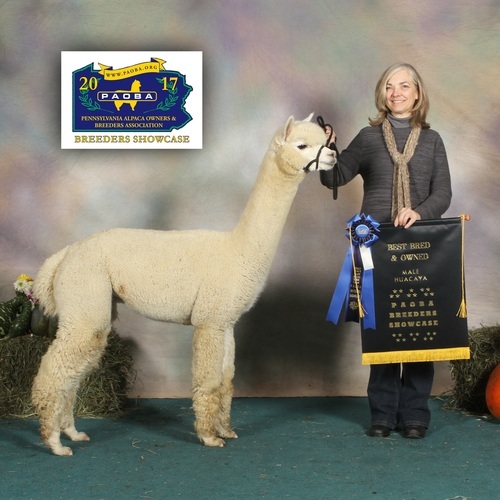 "he has a nice typey look..." and "...great uniformity and fineness within the staple and across the blanket, showing advanced fleece characteristics." SKIN BIOPSY was performed at 30 months of age by Dr. Norm Evans in December 2017. Of note, his 15x scan shows large fiber clusters uniform in shape and placement within his connective tissue. 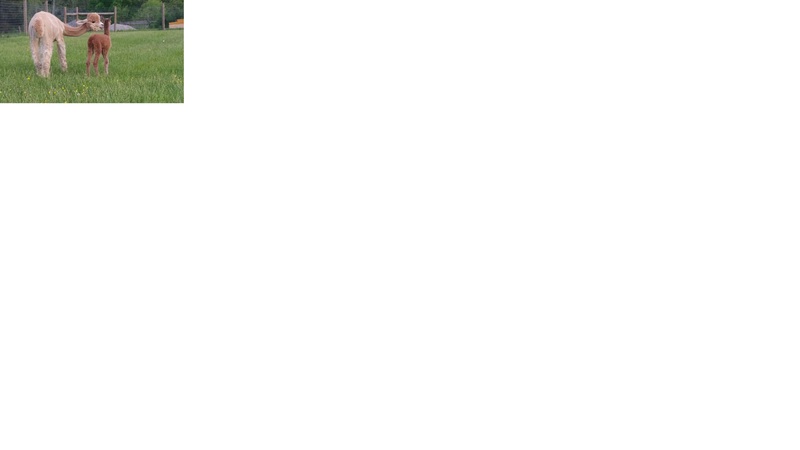 This uniformity trait likely came from his dam. His scan shows only 4 guard type hairs from the 6800+ fibers in his 10 MM tissue punch. His true density is 86.75 follicles per SQ MM of skin. He shows a level 2 of 4 gland structure, with an average S/P ratio of 14.1 to 1, and only 11% of his secondary fibers are medullated which is rare since the average is near 60%. His 250x scan shows the presence of many round secondary fibers, and one hundred typical secondary fibers averaged 17.8 microns. One to Watch for Sure!